Factual error: The General and Texas in the film have wooden cowcatchers with vertical slats. The Western and Atlantic used strap-iron cowcatchers with horizontal slats until after the Civil War, and such cowcatchers were worn by the General and Texas at the time the film takes place. Factual error: The General in the film has marked differences from the real engine as it appeared during the Civil War. The engine had three domes rather than two, and had ankle bars extending the full length of each side. The General in the film more closely resembles the prototype's post-1893 appearance. Factual error: The Texas engine's cab is noticeably rounded and appears riveted in close-up shots, indicating a steel cab of an 1890's vintage engine, rather than a wooden cab found on engines before and during the war. 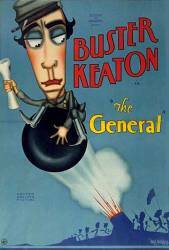 Factual error: Keaton's "General" locomotive is numbered '3' in the film, and the "Texas" is numbered '5'. The Western and Atlantic Railroad, like other railroads throughout the southeastern US, had only given its engines names, not numbers. The railroad began numbering its engines after the war, giving the General and the Texas the numbers '39' and '49', respectively. The General was renumbered 3 in 1880, at the time being the third oldest engine on the roster. The Texas was renumbered 12 at this time, then 212 in 1890, never carrying the number 5. Title: After a nice, quiet, refreshing night's rest.